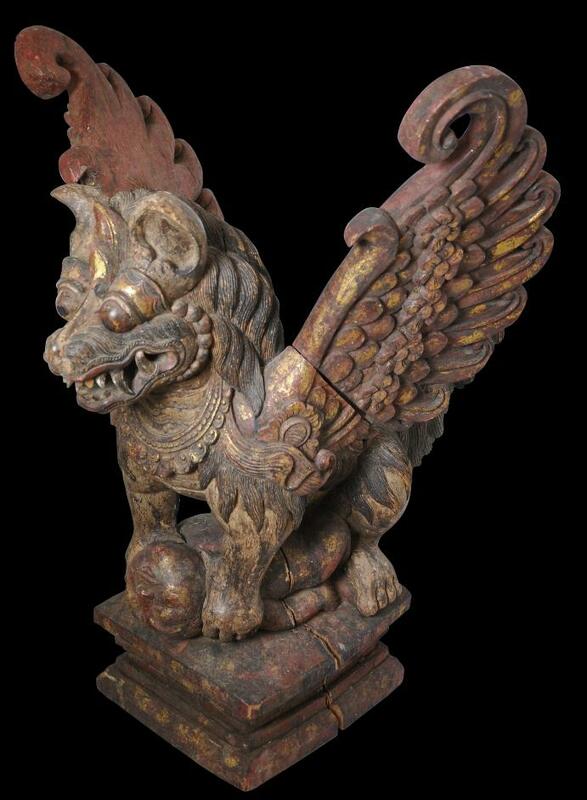 This splendidly carved free-standing wooden and polychrome image of a Balinese winged lion (singa bersayap or sometimes, singa ambara) would have been used as a mount (palinggih or wahana) for images of deities which would have been placed on the lion’s back during ritual celebrations and processions. 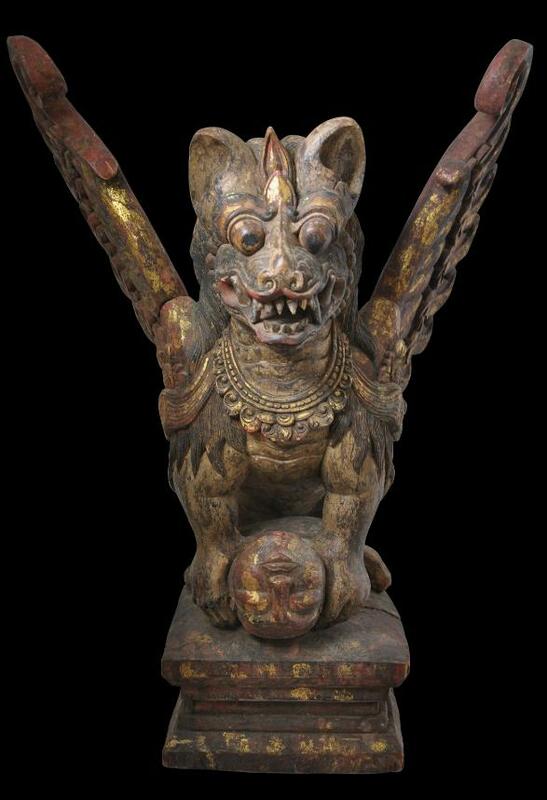 Most probably it is from northern Bali and would have adorned a temple (puri) complex where it would have been placed high up above an entranceway or in the eaves when not in use. It has a fierce countenance with bulging eyes, snarling mouth and flashing ‘S’-shaped tail. 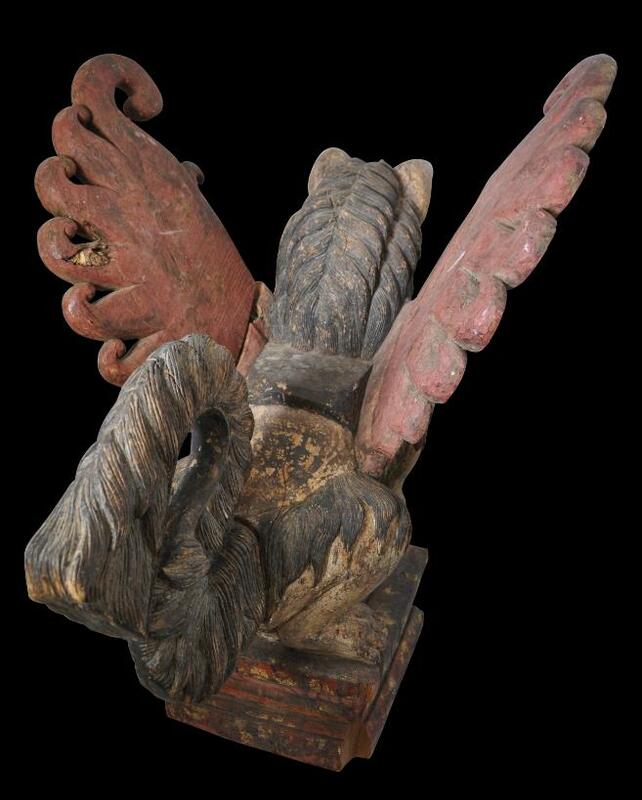 It’s wings are beautifully carved with feathers emanating from flowers – a typically Balinese confection. The lion stands on a tiered plinth with its paws holding down its prey – a fleshy infant – probably the offspring of a demon. The body of the lion, plinth and infant are all carved from the one piece of wood. 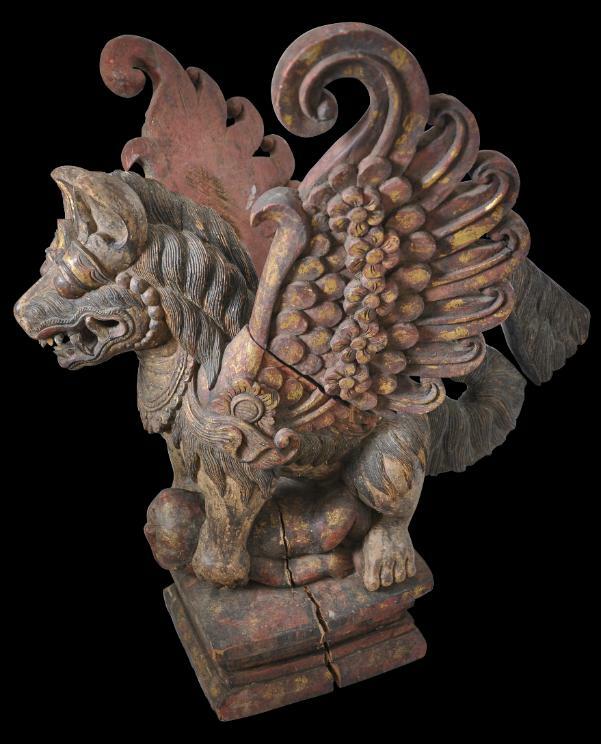 The tail and wings comprise three separate pieces which slot into the lion’s body. The image has black, red and yellow colouring and gold leaf highlights. The condition is remarkably good and complete. There are no significant losses to the carved detailing. 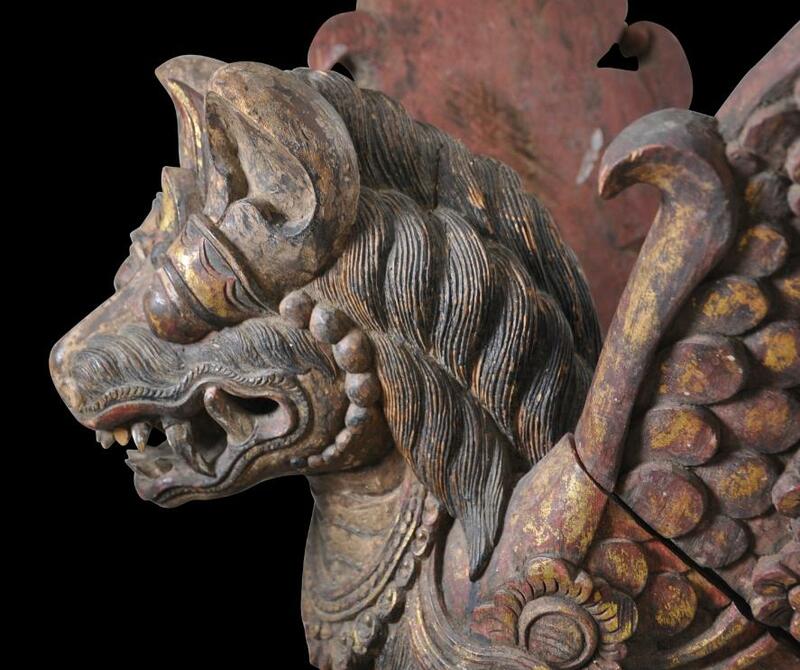 There is an old shrinkage-related crack to one side of the lion, a back corner of the stand has a chip to the edge, and the tail has several old breaks and a small section of one wing (no doubt along the grain) which have been carefully rejoined. Such issues are comparatively minor given the age and the material used. singa is an ancient symbol from India, where it is native, which denotes sovereignty and protection. 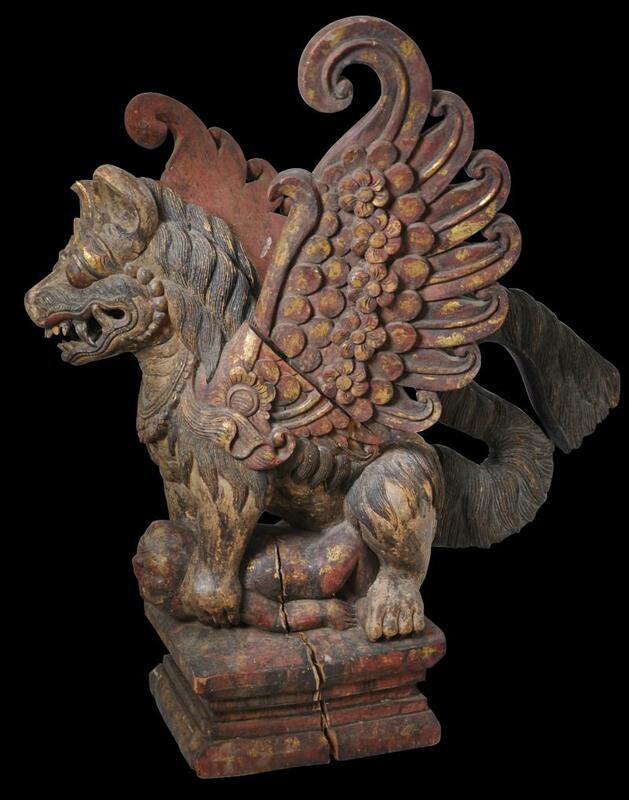 On Java and thence to Bali, the motif was incorporated into Hindu-Buddhist iconography. 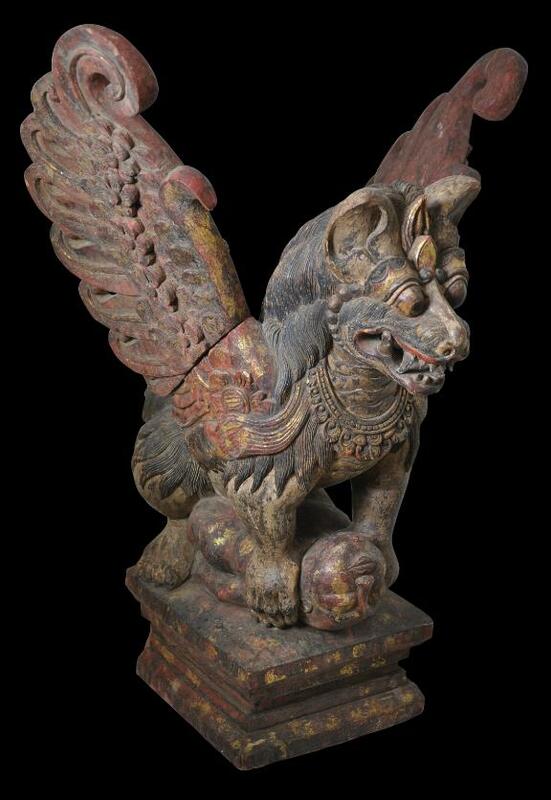 On Bali, the singa motif typically is winged and adorn temples as guardian figures. The item was acquired in the UK and has almost certainly been in the UK since colonial times. 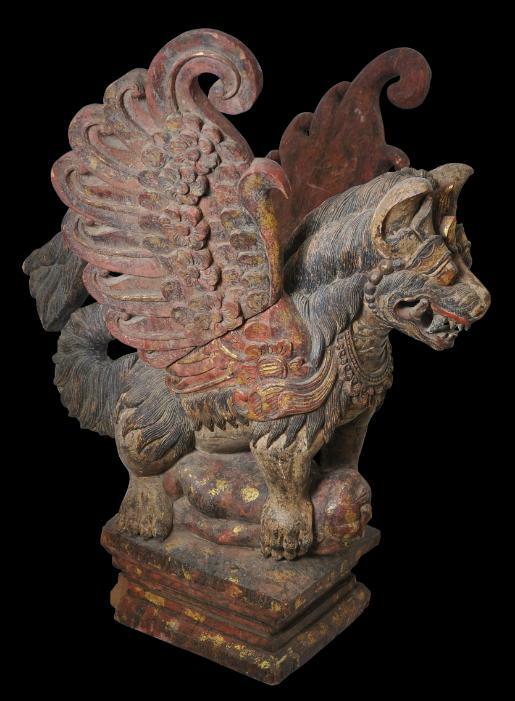 The quality of the carving and the surface patina suggest it dates to the 19th century. 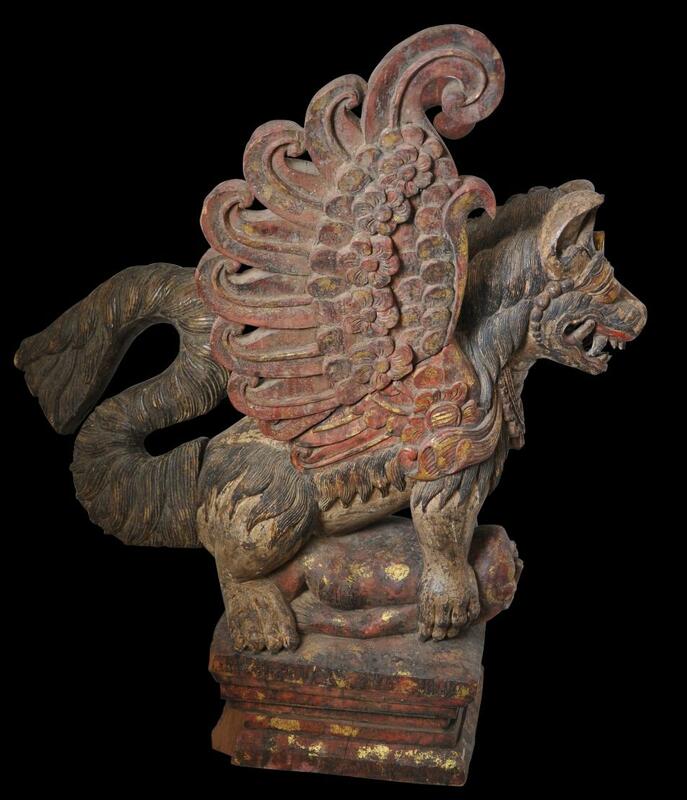 (Larger Balinese wooden items sometimes are found in old collections in the UK and date to the time when intrepid travellers sailed aboard steam ships and had large trunk entitlements.) Most probably was part of an old collection, it appears to have been in the UK for many decades. It is a superb item – the photos do not fully convey its quality and majesty. Maxwell, R. et al, Bali: Island of the Gods, National Gallery of Australia, 2014. The Art and Culture of Bali, Oxford University Press, 1977. Bali: Art, Ritual & Performance, Asian Art Museum, 2010. Nusantara: Highlights from Museum Nusantara Delft, C. Zwartenkot Art Books, 2014. 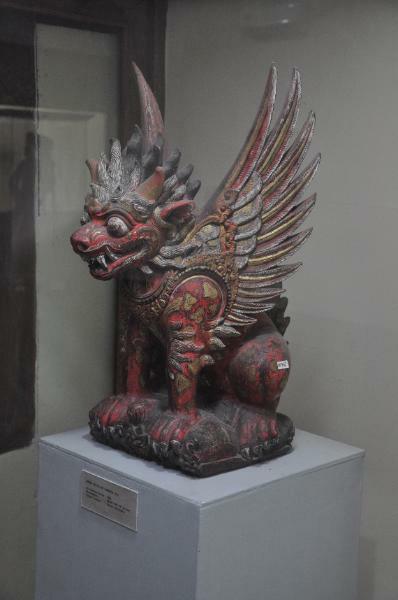 A related example, attributed to the 19th century, displayed in the Bali Provincial State Museum (Negeri Propinsi Bali), Denpasar, Bali.